Google Advanced Voice Search for the iPhone! 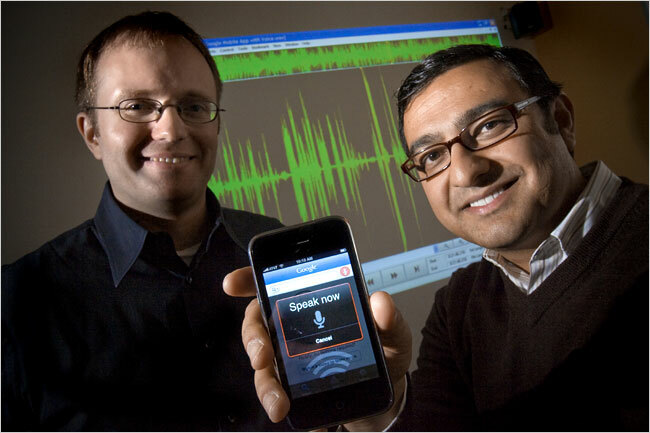 Users of the free application, which Apple is expected to make available as soon as Friday through its iTunes store, can place the phone to their ear and ask virtually any question, like “Where’s the nearest Starbucks?” or “How tall is Mount Everest?” The sound is converted to a digital file and sent to Google’s servers, which try to determine the words spoken and pass them along to the Google search engine. Will it be perfect? Nope. It will sometimes return nonsense, and indeed the researchers behind it claim it will never reach 100% -- but they're aiming to make it as good as it can possibly be. This caps off several weeks of Google announcements for the iPhone, of course, including OS 2.2 updates for Street-View, Transit and Walking Directions, and Location Sharing for the Maps App, the release of Google Earth, and an optimized version of the Google Search page for the iPhone. So, when's this hitting the App Store, and aside from candy, flowers, and a lobster dinner, what could possibly be next? !